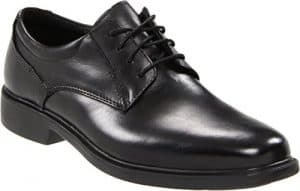 Whether you need them for work or you have a long day out at a wedding or other formal occasion, comfortable men’s shoes are not as hard to find as you may think. 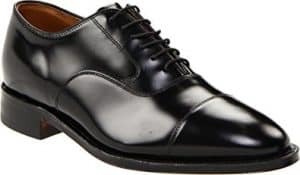 Dress shoes have an undeserved bad rep for not being comfortable, but if you get a good quality brand with the right fit and a good sole you shouldn’t have any trouble being on your feet all day. There are a lot of brands with either casual or more formal dress styles that you can wear all day without feeling any discomfort. We have rounded up some of the best looking, most functional men’s everyday dress shoes around. Rockport have many dress styles that are great if you are looking for all-day comfort. The key to Rockport’s designs is in the sole of their shoes. They have several different sole types and materials, with some of their most comfortable being a lightweight, shock-absorbent polyurethane. 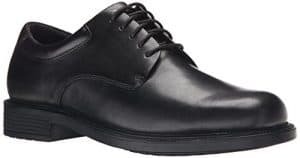 One of their most popular options with this sole is the Rockport Big Bucks Margin, it isn’t super dressy, but it can easily pass for a dress shoe at a wedding or formal function if need be. What the Big Bucks Margin excels at is being a great design for everyday, office wear as it is practical, light, and comfortable. The Big Bucks Margin requires no break-in period, they are very durable so they should last for years, and the sole has excellent traction so you won’t slip in wet weather. They are also relatively inexpensive and versatile, so for most men, they are well worth the investment. The only issue you may run into with this style is that it has minimal arch support. Regardless, if comfort is your top priority, they are worth checking out. A lot of men turn to the Bostonian Ipswitch when they are looking for a comfortable, business casual style. They are lightweight, look good and aren’t very expensive. They hold up well to everyday wear, especially if you are only wearing them for the office. The Ipswitch is also a good option if you have to wear them for walking either short or long distances and for wearing all day since they are light and comfortable. The only issue you may run into with the Ipswitch is that they don’t have a lot of traction on the sole so they can be slippery when walking in wet or icy conditions. This square-toe oxford style has medium arch support and features a low stacked heel. Despite their low price, they are stylish and beautifully made. Ecco brand has a reputation for making extremely comfortable and durable shoes, although the brand is often not regarded as quite as fashionable as other brands. One Ecco style that is both comfy and fashionable is the Helsinki Bicycle Toe Tie. It is a great shoe that offers a removable, antifungal footbed, with a high arch that is both lightweight and flexible. The comfort level in this style is significant for an everyday dress style, partly because of the excellent footbed as well as the padding at the back of the heel to keep your heel from getting blisters. The leather is also very soft and requires no break-in time. You can wear Helsinki Bicycle Toe Tie with a suit or jeans, so it makes a great casual dress choice, or it can easily be worn for special occasions. A beautiful looking, classic design that hits all of the comfort features that you need is the Florsheim Midtown Plain Toe Oxford. It is notable for its moisture-wicking Suedetec lining, which is a nice touch if your feet tend to overheat. The Midtown has a padded top line that helps make it exceptionally comfortable and the leather is soft, and it takes no time to break the shoes in. This oxford comes with a removable footbed that is heavily padded with Ortholite high rebound foam, so it is super comfy but still offers support or you can remove it if you would prefer to put in your own insole. The outsole is flexible rubber with a little bit of traction. The Midtown is a classic oxford style that comes in basic black as well as some other sweet looking finishes. Most people find Florsheim shoes to be very well made and reasonably priced for the quality that you are getting. A popular, classic style that works well for most comfort loving men is the Johnston & Murphy Melton Cap Toe. 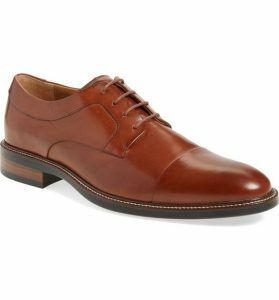 Johnston & Murphy use an Optima® Comfort System with multi-layered cushioning that provides shock absorption on the sole, so you know that they are going to be comfortable. The leather is hand-selected calfskin, making it very soft. Your feet also shouldn’t sweat much in the Melton because it has a perforated footbed that allows for breathability. One feature to be aware of is that it has a leather sole with a combination stacked leather and Fineline rubber heel so it looks dressy, but it probably won’t be as durable as some of the full rubber soles if you are doing a lot of walking. Some of Johnston & Murphy styles tend to be less fashionable and more old school classic styles. Cole Haan is always a great brand to check out for comfort styles. A beautiful dress design that is also comfortable is their Warren’ Cap Toe Derby. The construction and leather quality of Cole Haan shoes is usually top-notch, and the brand tends to design for style as well as comfort. 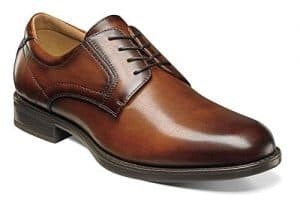 This Cap Toe Derby has Cole Haan’s proprietary Grand.OS cushioning system, which helps make it one of the best comfort dress styles going, although they do take a little breaking in. They also feature a leather upper and lining that is soft and high quality. The sole is rubber, so that helps add to the comfort level. It also has good traction, so they are good for walking, even in the winter. Cole Haan Derby is a little narrow, but you can get it in wide sizing if needed. 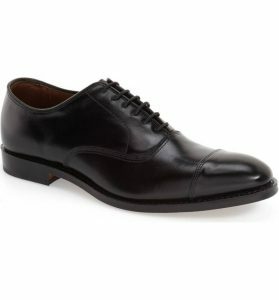 Sticking with Cole Haan for a minute, another super popular option is their Zerogrand Wingtip Leather Oxfords. 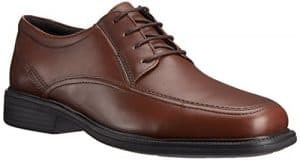 It is somewhat questionable whether these are a dress shoe, but if you are looking for something that might go well with business casual, these are a good choice. A lot of men mention they are more comfortable than most sneakers that they own, and depending on the color combination you may be able to wear this style with a suit and get away with it. They are one of the best looking and stylish options for the office or to wear casually on the weekends. The break-in period is minimal and the sole is beyond comfortable as it uses sneaker type materials and technology. If you are looking for a handsome dress style that it is also comfortable this is the way to go as they look casual, but can be worn for more formal events just the same. Clarks offer up some of the most comfortable shoes for the most reasonable prices. As far as men’s dress styles, one of Clarks best designs is the Tilden Cap Oxford. They are a great workhorse design so that you can wear them every day and they are super comfortable while still being reasonably stylish. They also appear to be very durable as well, so you should get many years wear out of them. The key to their comfort is the cushioned insoles. Apart from the comfort what is nice about this style is that you can wear them with business casual, but they also look good with a suit as well. For this style of shoe and level of comfort, these are a great value. The Bostonian Wendell Oxford is a good style for those who are looking for a fashionable, yet budget-conscious option. 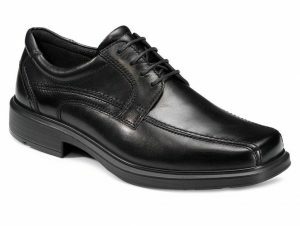 The Bostonian satisfies the needs for a light, comfortable office shoe that looks professional and will not break the bank. What is excellent about the Wendell, apart from being good value for the money, is that there is a significant cushion layer at the bottom of the footbed, so they are one of the more comfortable budget options. They don’t have a lot of traction if you are wearing them in winter weather, but if you stay indoors, they are fine. Since they are a budget option, they aren’t as durable as some of the other brands, but if you are looking for a style that you only wear infrequently or that you don’t mind replacing, then these are a good choice. Many men swear by Allen Edmonds, the high-quality dress shoemaker, as being one of the best brands for comfort. One of the most popular Allen Edmonds styles is Park Avenue. This iconic style is loved for the classic, yet stylish fit, feel of the material, and the quality of the workmanship. They are relatively pricey, but they will last for years if they are treated well. When the sole wears out, you can get them re-soled, to extend the life of the shoe. The only downside to the Park Avenue is the break-in period, which is a little longer than what you would have with a brand like Rockport or Clarks. Once broken in, the insole will mold to the shape of your foot, and the comfort level is well worth the time it takes to break the shoe in. Soles – The best type of soles to look for in a dress shoe for pure comfort is rubber. They don’t necessarily look the best, but if you are wearing the footwear daily, they are a better option than the leather soles that are often found on the very high-end styles. Fit– Obviously for the shoe to be comfortable it needs to fit properly. Try on lots of different types of brands and styles to see how they fit with your foot shape. You also need to make sure you get the right width for your foot, whether it is narrow, regular or wide. Breaking in Period– Most dress shoes will have a break in period. It is pretty unusual to get a pair that you can wear for extended periods straight out of the box with no discomfort. You can break them in by wearing them around your house or for shorter trips out. You can also use a shoe stretcher if you prefer to not break-in the footwear yourself. If you buy a style and find the leather isn’t breaking in, you could try a leather conditioner to try to soften the leather up for a more comfortable fit. Expectations- When you get a new pair of dress shoes, it is a good idea to remember that they aren’t going to feel as comfortable as a pair of running shoes. Generally, they take a while to get used to, even after they have been broken in no matter what brand you buy. If you don’t wear dress shoes very often, then they are going to feel uncomfortable because you won’t be used to them. Insoles– If you have a tough time finding a style that is comfortable for you, you should look into getting some cushioning insoles. They will make the footbed feel more comfortable and also give you more arch support if you need it. If you have trouble with your heel, there are also heel liners that can help. If you think you would benefit from using a cushioning insole, look for styles that have removable footbeds or consider sizing up so the insert will fit.